Fashion shops and luxury butiques are one extra tourist attraction of Cortina d'Ampezzo. Tourists can have a great time shopping at Cortina, "The Pearl of Dolomites". 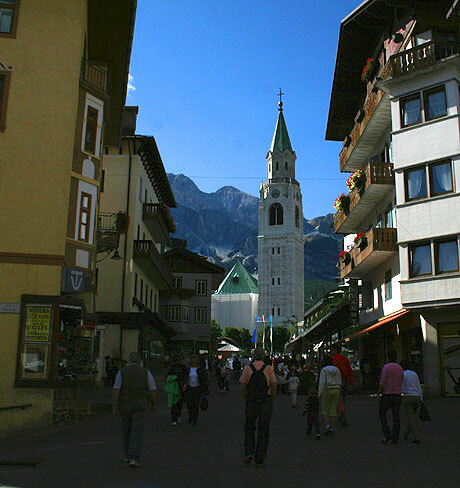 The most popular shopping area in Cortina d'Ampezzo is the Corso Italia pedestrian way. Here one can find famous fashion and clothing brands, the fashion houses and designers exhibiting their latest work. The quality of all products is exceptional, one can purchase from the clothing, sport equipment and clothes, jewelry, antiques to arts and paintings. Shops in Cortina open around 9:00 AM – 12:30 and 15:30 to 19:30 in the evening. During the ski season, the shops are open for a longer time but they usually close around 20:00. In the Winter Season, the shops in Cortina d'Ampezzo open on Sundays and bank holidays. If you are missing an accessory or a part of your skiing or snowboarding equipment, you will definitely find a shop where you can buy any sports equipment items, skis, snowboards, boots, etc. Sottosopra – sells clothing accessories and handcrafted art objects. Ampezzan Fiori – sells clothing accessories and handcrafted art objects.